The blindfolded code training exercise, which blindfolds the team leader in a code resuscitation simulation, is an advanced teaching technique to improve closed-loop communication, organizational skills, and critical thinking. Hughes, P. G., Hughes, K. E., Ahmed, R. A. Setup and Execution Of the Blindfolded Code Training Exercise. J. Vis. Exp. (145), e59248, doi:10.3791/59248 (2019). Miscommunication is the most common cause of preventable patient harm in medicine. Currently, there is limited knowledge of innovative techniques to improve resident physician communication and leadership strategies in high-acuity situations. The blindfolded code training exercise removes visual stimuli from the team leader, forcing the team leader to effectively utilize closed-loop communication. The simple act of blindfolding the team leader creates a learning environment where the leader must utilize a conceptual framework and critical thinking strategies to organize the team and manage the resuscitation. An advantage to this teaching technique is that it does not require any special simulation equipment, making it a low-cost approach. The blindfolded code training exercise can be applied to the management of any critically ill patient where the primary objective is to focus on developing communication skills in acute resuscitations. The purpose of the description of the blindfolded code training exercise is to provide guidance on how to perform this innovative teaching technique to force effective closed-loop communication. The blindfolded code training exercise was developed to improve closed-loop communication, the utilization of a conceptual framework to organize the management of a resuscitation, and critical thinking skills. Previous scholars reported that communication, role clarity, and teamwork were enhanced by blindfolding physicians during simulated resuscitations1. Resident physicians, especially in critical care specialties, are frequently placed in high-acuity situations. In order to appropriately manage these high-risk cases, resident physicians require training in both leadership strategies and communication in high-risk environments2,3. Simulation is commonly used and is effective in teaching crisis resource management principles and communication skills4. Currently, there is limited knowledge of innovative techniques to improve resident physician communication and leadership strategies in high-acuity situations. Ineffective communication may continue despite correct management and leadership observed in the simulation lab. A previous study highlights that the blindfolded code training exercise, when compared to typical code training, is more challenging and forces learners to use critical thinking skills and closed-loop communication. Learners felt the exercise solidified leadership skills and challenged them to maintain mental organization without visual cues5. In preparation for the blindfolded code training exercise, the faculty provides a demonstration explaining how this advanced approach is performed, to decrease learner intimidation by the exercise. Once the demonstration is finished, the team leader is blindfolded. The team leader must use closed-loop communication and give explicit orders to the resuscitation team with a request to have all orders repeated back. The team cannot independently initiate any procedure or management without clear direction from the team leader. Team members can only execute orders from the team leader that are explicitly directed to them by name. If the team leader does not identify a specific person to perform the action, it is not performed. For example, if the team leader states, “Start compressions” without directing it to a specific team member, the order is not completed. All members of the team stand motionless. If a team member is given an order by the leader but is not requested to repeat the order as confirmation, the order can be executed but the team leader is not given verbal feedback at the completion of the order. This should prompt the team leader to ask that subsequent orders are to be repeated back, as the leader does not have visual stimuli to confirm order completion. If the team leader asks team members to repeat the orders back, team members must reply to the team leader using closed-loop communication. This alerts the team leader when the order is received and completed. For example, if team leader Dr. Jones asks John to “Give 1 mg of epinephrine intravenously”, John will reply “I will get 1 mg of epinephrine. Dr. Jones, 1 mg of epinephrine has been administered intravenously”. The team leader can ask questions about the monitor. However, team members can only describe the appearance of the cardiac rhythm in layman’s terms (Table 1). For example, ventricular tachycardia would be described as a wide complex regular rhythm at the rate displayed on the monitor. Team members cannot use medical terms when describing the cardiac monitor, such as ventricular tachycardia or pulseless electrical activity. Lastly, faculty will verbally clarify all physical exam findings if the code team leader directs a team member to perform a physical exam. By removing visual stimuli, the blindfolded code training exercise forces the team leader to maintain mental organization and use closed-loop communication to effectively manage a resuscitation. The purpose of the description of the blindfolded code training exercise is to provide guidance on how to perform this innovative teaching technique to force closed-loop communication. All methods described here were exempt from review by the Summa Institutional Review Board. Prepare the simulation lab prior to beginning the blindfolded code training exercise. Prepare all supplies needed for code resuscitation, including an intravenous (IV) start kit, IV fluids, a code cart, a defibrillator with pads, a bag valve mask, a non-rebreather mask, a nasal cannula, a pulse oximeter, and intubating supplies (including a laryngoscope, an endotracheal tube, a stylet, a syringe, an end-tidal carbon dioxide monitor, and a cardiac monitor). Place the human-patient simulator on an emergency department bed. Turn on the simulator and connect it to the wireless network. Set the simulator vitals to match the case scenario. Provide a chair or stool and blindfold for the code team leader. Place the team leader 5 feet away from the foot of the bed, facing away from the team. Print code resuscitation simulation scenarios for the faculty. Read the simulation scenarios prior to the start of the session. Upload any necessary radiographic images and electrocardiograms for each patient scenario. Review the rules of the exercise with the learners. Provide a demonstration for the learners of the blindfolded code training exercise. Select a code team leader from the group of learners. Initially, start with more experienced learners as code team leaders. Sit the code team leader down on a chair or stool at the foot of the bed, facing away from the patient. Blindfold the code team leader. NOTE: The best resuscitation team configuration is one embedded nurse, three resident physicians, and one resident as code team leader. Ensure that resuscitation team members verbally introduce themselves by role, name, and position in relation to the patient in the bed to the blindfolded code team leader prior to the start of the scenario. Start the scenario by reading the stem for the case scenario to the code team leader. Run the case scenario for approximately 8–10 min. Change the patient vitals and cardiac rhythms in alignment with the case scenario outline. Debrief the code team at the conclusion of the case scenario for approximately 10 min. NOTE: Focus on the utilization of closed-loop communication, the leader’s effectiveness in leading the resuscitation, and the management decisions as they relate to the advanced cardiac life support (ACLS) or advanced trauma life support (ATLS) algorithms. Select another code team leader and repeat the process at the conclusion of the debriefing. As noted in Ahmed et al., all residents (100%, 27/27) agreed/strongly agreed that knowledge obtained during the blindfolded code training exercise could be transferred to the clinical setting5. In addition, most residents strongly agreed that the blindfolded code training exercise was more challenging (81.5%, 22/27), allowed them to apply critical thinking skills (81.5%, 22/27), and improved use closed-loop communication (88.9%, 24/27) when compared to typical code training exercises (Table 2). Qualitative themes identified from the resident surveys in Ahmed et al. included solidifying leadership skills and ACLS knowledge and improving closed-loop communication5. Residents felt that maintaining mental organization without visual cues was the most challenging part of this exercise. Figure 1: Blindfolded team leader and resuscitation team. Blindfolded team leader, seated and rear-facing, with the surrounding resuscitation team members and simulation manikin. Please click here to view a larger version of this figure. 2nd degree heart block- Type 1 Mobitz (Wenckebach) Progressively lengthening PR intervals with dropped QRS complex after P wave. 2nd degree heart block- Type 2 Mobitz Consistent PR interval with intermittent dropped QRS complexes after P wave. Table 1: Rhythm description. Acceptable layman’s terms for specific cardiac rhythm descriptions. This table has been modified from research by Ahmed et al.5. Table 2: Survey results. Written survey responses from participants (N = 27). This table has been modified from research by Ahmed et al.5. The blindfolded code exercise consists of several critical steps. 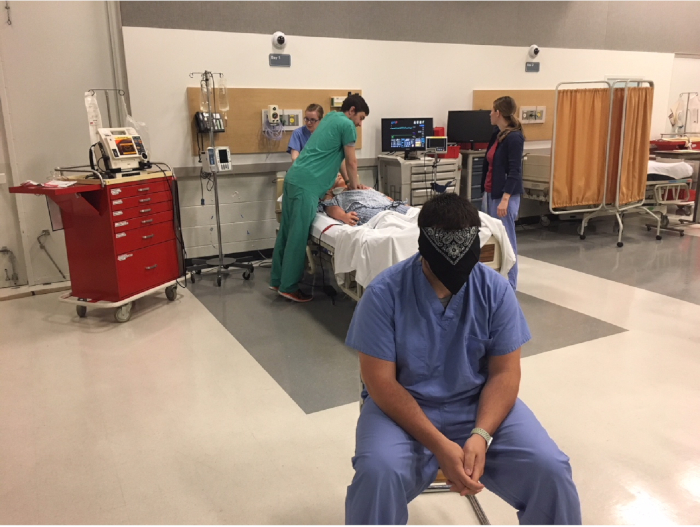 First, the exercise requires an initial faculty demonstration to decrease the learners’ intimidation and anxiety toward performing a resuscitation blindfolded. It also serves to give learners an example of a successful performance of the blindfolded resuscitation. Facing the code team leader away from the resuscitation team ensures that the leader is unable to visualize the scenario and forces them to give loud, clear orders (Figure 1). In addition, start senior residents as code team leaders, as this exercise requires leaders to maintain a conceptual framework to organize their management and multitask without visual stimuli. The team leader must give explicit orders in closed-loop fashion to successfully manage the resuscitation. Running the scenario for 8–10 min allows the leader to manage the case for four to five cycles of CPR. This provides ample opportunity to evaluate effective usage of closed-loop communication and adherence to resuscitation algorithms. Lastly, it is important to debrief the learners at the conclusion of each resuscitation. Debriefing is the most critical portion of a simulation and is the key to maximizing knowledge and skills gained during the exercise6,7. This innovative teaching technique can be applied to the management of any critically ill patient, with a primary focus on developing high-risk communication skills. During high-acuity trauma resuscitations, effective communication is critical to optimal management8. Removing visual stimuli forces learners to use closed-loop communication strategies and methodically approach the resuscitation, focusing on the execution of the primary survey without prematurely progressing to the secondary survey. Scholars have demonstrated that teams have fewer errors, fewer delays in diagnosis, and better patient outcomes when systematically following ATLS protocol9,10,11,12. There are only a few limitations of the blindfolded code training exercise as it does not require any special simulation equipment, setup, or added costs. The exercise can be performed in situ or in a simulation lab. However, this exercise is typically limited to more experienced learners from acute care specialties, as novice participants may become overwhelmed without the ability to use visual prompts during resuscitation management. Presently, there is a paucity of literature on innovative techniques to improve resident physician communication and leadership strategies in high-acuity situations. This novel teaching technique provides a nontraditional approach to force closed-loop communication. Future directions for this study include utilizing validated assessment tools to evaluate closed-loop communication, crisis resource management strategies, and resuscitation performance when comparing blindfolded leaders to nonblindfolded leaders in the management of critically ill patients. Brindley, P. G., Hudson, D., Lord, J. A. The blindfolded learner – a simple intervention to improve crisis resource management skills. Journal of Critical Care. 23, (2), 253-254 (2008). Accreditation Council for Graduate Medical Education. ACGME Program Requirements for Graduate Medical Education in Pulmonary Disease and Critical Care Medicine (Internal Medicine). https://www.acgme.org/Portals/0/PFAssets/ProgramRequirements/156_pulmonary_critical_care_2017-07-01.pdf (2017). Accreditation Council for Graduate Medical Education and American Board of Emergency Medicine. The Emergency Medicine Milestone Project. https://www.acgme.org/Portals/0/PDFs/Milestones/EmergencyMedicineMilestones.pdf (2015). Murphy, M., Curtis, K., McCloughen, A. What is the impact of multidisciplinary team simulation training on team performance and efficiency of patient care? An integrative review. Australasian Emergency Nursing Journal. 19, (1), 44-53 (2016). Ahmed, R., Hughes, K., Hughes, P. The blindfolded code training exercise. The Clinical Teacher. 15, (2), 120-125 (2018). Ryoo, E. N., Ha, E. H. The Importance of Debriefing in Simulation-Based Learning: Comparison Between Debriefing and No Debriefing. Computers, Informatics, Nursing. 33, (12), 538-545 (2015). Shinnick, M. A., Woo, M., Horwich, T. B., Steadman, R. Debriefing: The Most Important Component in Simulation? Clinical Simulation in Nursing. 7, (3), e105-e111 (2011). Bergs, E. A., Rutten, F. L., Tadros, T., Krijnen, P., Schipper, I. B. Communication during trauma resuscitation: do we know what is happening? Injury. 36, (8), 905-911 (2005). Carter, E. A., Waterhouse, L. J., Kovler, M. L., Fritzeen, J., Burd, R. S. Adherence to ATLS primary and secondary surveys during pediatric trauma resuscitation. Resuscitation. 84, (1), 66-71 (2013). Spanjersberg, W. R., Bergs, E. A., Mushkudiani, N., Klimek, M., Schipper, I. B. Protocol compliance and time management in blunt trauma resuscitation. Emergency Medicine Journal. 26, (1), 23-27 (2009). Fitzgerald, M., et al. Using video audit to improve trauma resuscitation—time for a new approach. Canadian Journal of Surgery. 49, (3), 208-211 (2006). Hughes, P. G., Ahmed, R. A. The Blindfolded Trauma Team Resuscitation: a strategy for improved leadership and communication. BMJ Simulation & Technology Enhanced Learning. (2017).